Geraniums are a common plant genus with more than 400 species worldwide. New Zealand has its own share of species with seven native species and nine introduced species. There is, however, a reasonable level of variation within some of the native species, including variants in the ultramafic Red Hills. 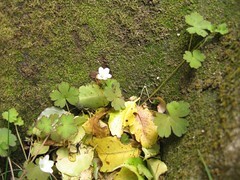 Other species are found on the Chatham Islands (Geranium traversii) and through the Subantarctic (G. microphyllum). A DNA-based study was undertaken by Anthony Mitchell (University of Otago), Peter Heenan (Landcare Research) and Adrian Paterson (Lincoln University) of samples from all species and most variants in order to look at evolutionary relationships, time of divergence events and species status. In a paper published in the New Zealand Journal of Botany (47:21-31), the researchers conclude that there is low genetic variation within native New Zealand Geranium indicating that they are very closely related and the likely result of one colonising event to New Zealand. More sampling of Geranium species in South America and Australia would help to determine the likely source of these colonists. Morphological variation (like leaf shape and patterning) appeared to be a reasonable predictor of species status with plants that look different actually also being different at the molecular level. The level of differences between different populations also suggested that they may actually be at least five different species (although confirmation of this would require more detailed work). This work shows that even in reasonably well-studied groups that there are still many species to be found in New Zealand. Kānuka vs. gorse, the battle is on!